There clearly is a partisan divide on these issues, but as Fuentes-George notes on his blog, environmental issues have had Republican support in the past. Over at Legal Planet, there are some thoughtful posts by Matthew Kahn and Dan Farber about the partisan divide. Farber usefully shares his own attempt at making an objective side-by-side comparison as well. 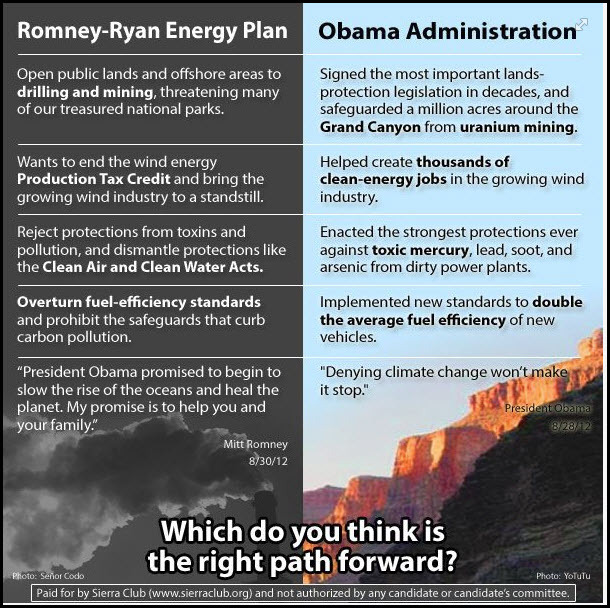 One only needs to follow the blogs of the Sierra Club and similar environmental groups to discover very quickly who they think the best choice for President will be. Below is the infographic from a North Carolina chapter. Unfortunately, Obama himself seems to be less committed to doing something about climate change than he once was (energy biz). The most recent evidence of this may be his decision to OK drilling in the arctic (Reuters).